1. Close Gaps slider: Use this slider to determine the size of the gap you want to be closed. Move the slider to the left for smaller gaps and move it to the right for bigger gaps. 2. 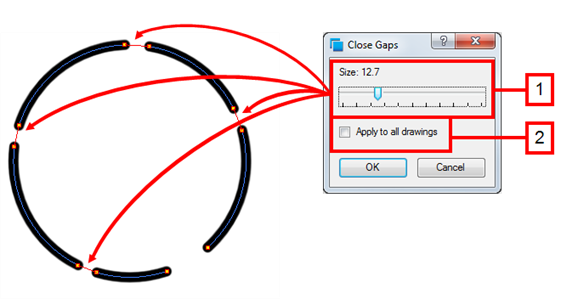 Apply to all drawings: Enable this option so that the Close Gaps feature is applied to all the drawings of the selected layer. 1. Select the Show Strokes option to see a preview of the result. 2. Select View > Show Strokes or press [K]. 3. Select Drawing > Clean Up > Close Gaps or press[Shift] + [F10] (Windows/Linux only). 5. Select the Apply to all drawings option if needed. Refer to Colour Preferences at the end of this chapter to learn more about the Close Gap options.